Over a month since I posted here. I do apologise but other things have taken priority. My Mum had been in and out of hospital all year, mostly in. In early May I was busy trying to prepare for her discharge, which finally happened but was a disaster, and within 4 days she was back in hospital again. I realised she probably wouldn’t be able to cope in her own flat and I’d need to look for a care home… when she got better again. But this time her chest infection did not respond to antibiotics. Mum had her 80th birthday in hospital on 26th May – we took a cake and some prosecco in, and the dozens of cards which had arrived for her to open. She enjoyed this – as much as it’s possible to enjoy a birthday while in hospital. A few days later the hospital called me to say she’d had a very bad turn. I went to see her and was told to be prepared for the worst. My brother arrived. We spent the next 4 days at her bedside. I slept overnight at the hospital in special accommodation for relatives. Mum spent these days sometimes sleeping, sometimes awake, trying to talk to us with clearly a lot on her mind. It was hard to make out what she was trying to say but we did our best. My cousins visited, bringing Mum’s brother to see her. We all knew it’d be the last time. Early morning on 4th June I walked across from the accommodation block to Mum’s ward, in sunshine and with the birds singing, and I knew that would be the day. Around lunchtime Mum made it clear she’d had enough, and I asked the hospital staff to stop treating her except for pain relief. Mum pulled her oxygen tube off herself. My brother and I sat with her till the end, holding a hand each. It was the most difficult thing I have ever done, but I hope we eased her journey. She died at 4pm. She was ready to go, and had been in control of the end, and died with her children at her side. I suppose that is as good a way to go as any. The days since then have been taken up with all the necessary practical arrangements. We have held a celebration of Mum’s life for all her friends in her local church. There’s a cremation service for family only in a few days time. I’ve begun the process of notifying companies and banks etc. 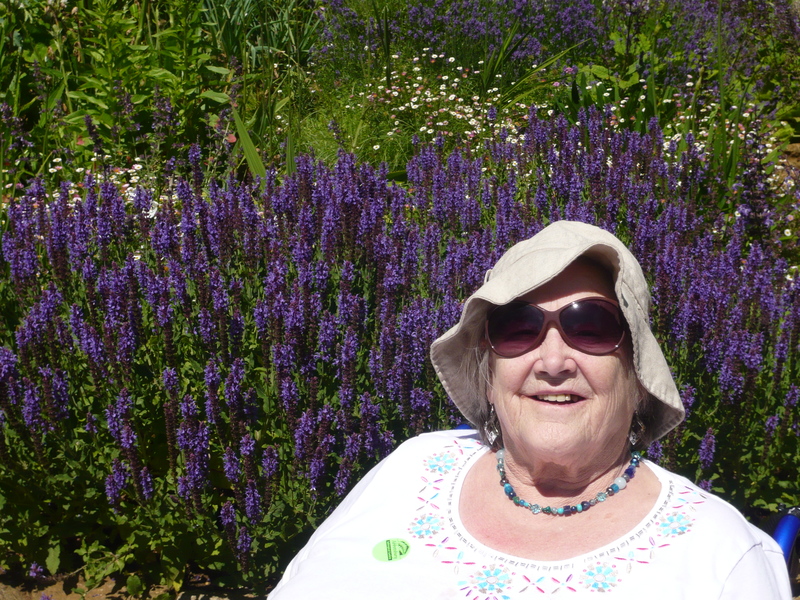 I wrote the eulogy for Mum, which was read by a family member at the service last Thursday. It was a difficult thing to write but I wanted to do her proud. This is not the place to publish the whole thing, but I’ll share this paragraph from near the end. My mum was a very special person, and will be missed by very many people. Maureen had what you might call a butterfly brain. She’d alight on one topic of conversation, then be distracted by the pretty colours of another topic, and off she’d fly. It was sometimes a hard job to keep up with her, but we all loved her for it. She was a magpie, drawn to bright colours and shiny things. She was our ‘bird of paradise in her bright plumage,’ said one friend. She could be exasperating at times but was always upbeat and positive. She could drive you mad while at the same time you’d be full of respect for her. She would remember people’s birthdays but forget how to use her mobile phone. She would look after everyone else but not herself. She was warm and caring and an inspiration to many. I find it hard to believe she is gone. I know it’ll get easier over time but right now I miss her immensely. I wanted to ask her opinion on how many people to cater for at her memorial service last Thursday. I wanted to phone her afterwards and tell her all about it. I want to show her all the letters and cards I’ve received. Although I had the time to say goodbye I still wish I could hold her hand and kiss her cheek one last time.